Savello pounced late to record a one and a quarter length victory in the final race of the 2014 Cheltenham Festival, the Johnny Henderson Grand Annual Challenge Cup, at odds of 16/1. The eight-year-old capped off an extraordinary day for owners Gigginstown House Stud, who were celebrating an 82,653/1 four-timer after Tiger Roll (JCB Triumph Hurdle), Very Wood (Albert Bartlett Novices' Hurdle) and Don Poli (Martin Pipe Conditional Jockeys' Handicap Hurdle) had all won earlier in the afternoon. The Tony Martin-trained gelding was given a fantastic ride by Davy Russell, who himself was landing a 3,926/1 treble following his successes on Very Wood and Lord Windermere (Betfred Cheltenham Gold Cup). "I'll never forget this day - it's been incredible," said Michael O'Leary, owner of Gigginstown House Stud. "You wait two years for a winner at The Festival and then four come along in one day. We've got a couple of guests in our box and a couple of them have done a £2 accumulator on our horses - they've won over £150,000!" "I'm delighted for Tony (Martin, the trainer) as well as his horses haven't had the best of luck this week. To be honest, I thought this one had no chance but it's all come together. It goes to show you what confidence can do. Davy (Russell, the jockey) has given him another great ride but he's on a high after his double earlier on. "I really feel sorry for Bryan Cooper though after his horrible injury (Cooper broke his leg after a fall on Clarcam in the Fred Winter Juvenile Handicap Hurdle on Tuesday). Our thoughts are with him and all the injured jockeys this week." Trainer Tony Martin was relieved to have got off the mark for this year's Festival in the very last race. "It's not been the easiest week but we thought he had a squeak coming into this race," said the trainer. "It's great for Davy who has not had the easiest few months but when you're riding like he is now, your horses always have a chance. It was probably the ride of the week. The horse missed the fourth last and the second last but when you've got the balls to sit and wait like Davy did, there's always a chance." An unforgettable day for jockey Davy Russell was finished in grand style when he took the closing race on Savello. z Savello, who is trained by Tony Martin, started at 16/1 and completed a four-timer on the day for his owner, Michael O'Leary of Gigginstown House Stud. 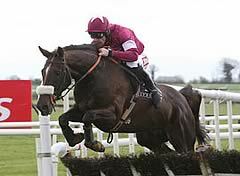 Ironically, at the end of December, Russell lost his job as first jockey to Gigginstown in favour of Bryan Cooper. When Cooper broke his leg on Tuesday at The Festival, Russell was called up to renew his association in the familiar purple and white colours. Russell said of Savello: "When you've got the machinery it makes the job a lot easier, and obviously Tony is a marvellous trainer, but there's nothing easy about this horse and as you can see, he wears a hood. "He can get quite lit up and we've spent so long trying to get him to settle. All credit to Tony, because he's very much a spooky horse and anything can set him off. "It went well in the race and I didn't want him to jump any better because I was in the position I wanted to be and was always happy I was going to get there. I had to sit and suffer at the top of the hill, but as he stays a bit further he was going to get home."